Looking for some tell-all advice to make your wedding planning that little bit easier? You’ve come to the right place— we’ve interviewed four of our favourite celebrants to spill all their tips and tricks. I Am Celebrant Sam has the Brisbane couples covered. He is a young and laidback celebrant that puts a modern twist on traditional ceremonies. Melissa Soncini, a born and bred Sydney-sider, speaks straight from the heart. She knows no two love stories are the same, so no two ceremonies are the same either (plus, she isn’t afraid to break a couple of rules too!). Rachel from Two Small Words is all about bringing the good vibes. This Queensland-based celebrant brings a ray of sunshine to every wedding. Kathleen Ryan is the go-to celebrant for any wedding in Tasmania. 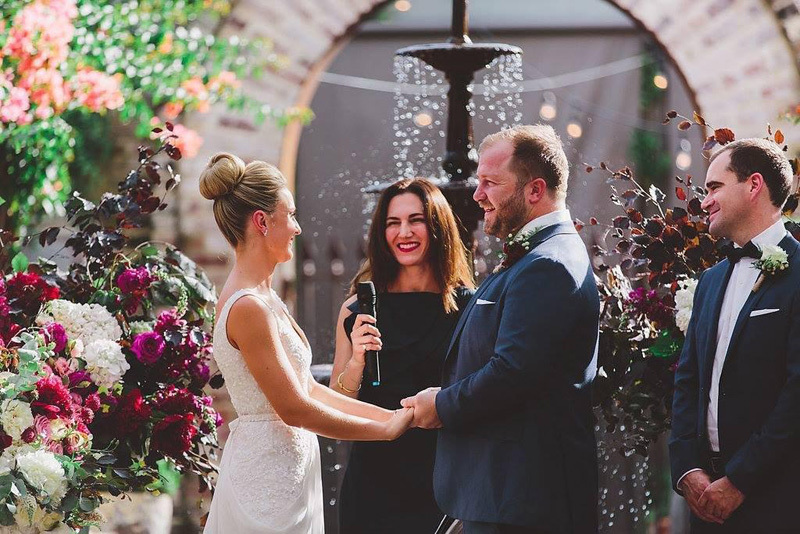 Kathleen ticks all the boxes for a fun spirited and uplifting ceremony. These fab celebrants really know their stuff. 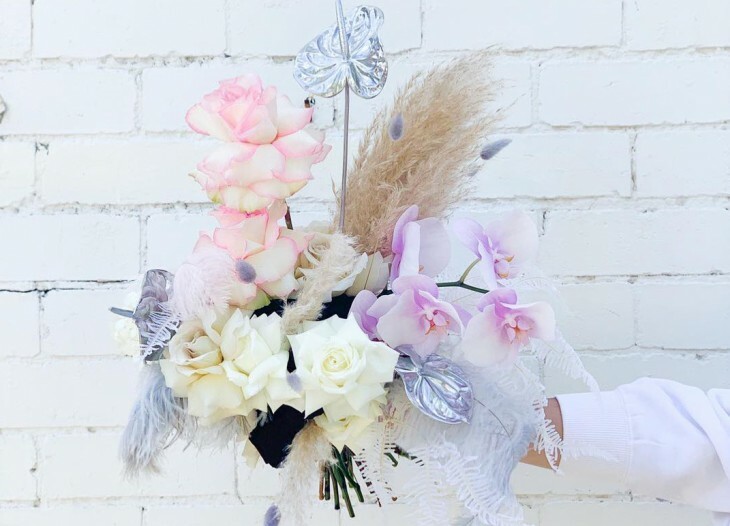 From choosing the right celebrant to how to make the ceremony uniquely you, keep scrolling to learn all their secrets. CAN YOU TALK US THROUGH YOUR PROCESS OF PLANNING A WEDDING WITH A COUPLE? After I receive an enquiry, I send through my price, my deposit requirements and then a little run down on how things will work from there to give the couple an idea on the next steps all the way to the wedding. Usually, after that we’ll organise a meeting to make sure I’m the right guy for them and if they’re happy to go ahead, I send through my questionnaire. Once I receive the completed questionnaire, I then create the ceremony and we’re ready to go on the day. I like to meet couples about 2-3 months before their wedding to plan the ceremony in detail, so I know that everything is fresh and relevant (we also sign necessary paperwork at this meeting). I have an example ceremony on hand to show them how things can go. I explain the three things that MUST happen for them to be married (monitum, legal vows, signing documents) and explain that every other detail is a “frill” but not a legal requirement and they can go as simple or frilly as they like. HOW WOULD A COUPLE KNOW WHEN THEY’VE FOUND THE RIGHT CELEBRANT? When you feel like, even if they weren’t going to be your celebrant, you could see yourself enjoying their company. It’s important that you also like their style as they will be in a lot of your photos. That’s easy! 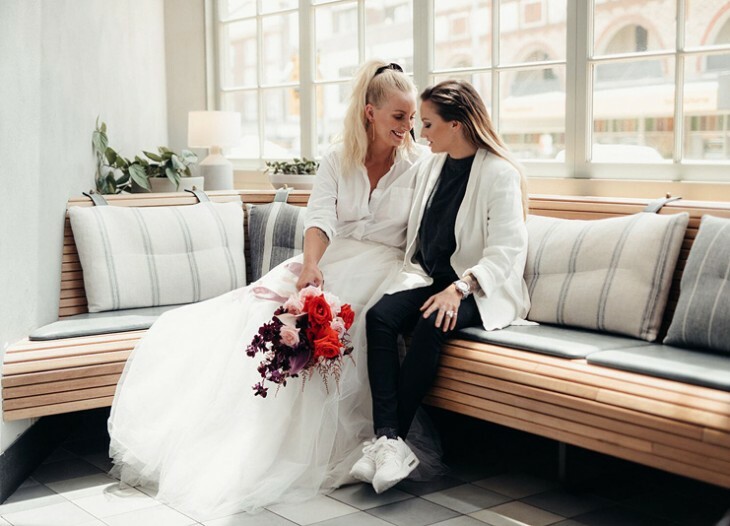 You know the celebrant is right for you when you feel so comfortable chatting about your ceremony ideas with a celebrant that it feels like you are talking to an old friend that just happens to be an expert on wedding ceremonies. You walk away from the first meeting excited about planning the wedding ceremony and have total confidence that the celebrant will be someone you will enjoy interacting with in the lead-up and on your wedding day. HOW CAN A COUPLE PERSONALISE THEIR CEREMONY? I personalise every aspect of the ceremony. From how long they want it to go, to what they want me to wear, to adding in readings, to telling their own little love story from the first time they met through to the engagement. The possibilities are endless – if you can imagine it, I’ll play along every time. I have had a bride who wanted to prank her father-in-law during the ring exchange (he wasn’t fooled but it was still hilarious) and I’ve sprung pop quizzes mid-ceremony. Generally, most couples don’t deviate too far from the standard ceremony format but my advice is always “if it’s a ‘should’, don’t include it”. For example, Mum says I should have Uncle John do a reading, or my sister says I shouldn’t walk down the aisle to Blink 182, or the wedding coordinator tells the groom he should walk down the aisle too. 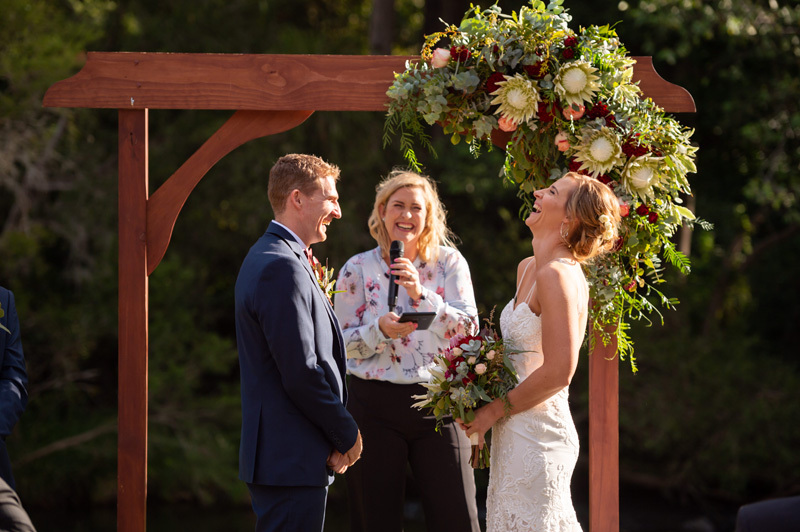 The ceremony is a reflection of who you are as a couple and as long as the three legal requirements are satisfied, your ceremony can look and sound any way you want it too! ANY TIPS FOR COUPLES WHEN WRITING THEIR VOWS? Take your time, use your own words. It’s the one time in your life you need to put how you feel down on paper so enjoy it. Speak from the heart and keep it authentic. Everyone at the wedding knows you well, so don’t pretend to be anyone but yourself. If you aren’t a wordsmith, your celebrant can send you many vow examples that you can find inspiration from. I often get asked “How long should my vows be?” and my answer is always this: 3 kisses long. Say what you need to say, whether it three lines, three paragraphs or 3 pages. WHAT MAKES A WEDDING MEMORABLE TO YOU? The people. I remember their faces and their story because that is what I find most interesting. I won’t remember what their flowers looked like but I will remember the atmosphere we created and how it felt to be a part of their celebration. The most memorable weddings for me are the ones when everyone is completely, totally present. Everyone, from the guests to the couple are in the moment, they are laughing and crying. They are thinking about the couple and how far they’ve come, they are reflecting on their own lives. A memorable wedding is seeing a couple pull off the most honest celebration of their love. Whether it’s extravagant and over the top or simple and minimalist. I love seeing couples beam with sheer delight on their wedding day knowing that their vision and feel for the start of their lives together is exactly how they want it. BEST PIECE OF ADVICE YOU’D GIVE TO SOMEONE PLANNING A WEDDING? Enjoy the process. Don’t let anyone tell you what you want for your wedding. Your parents have had theirs and anyone else can have their own. Most likely, there will be something that won’t go to plan. Try and be comfortable with the idea of dancing in the moment and that spontaneity and naturalness can add to the charm and memory of your wedding day. BEST PIECE OF ADVICE FOR A BRIDE AND GROOM TO REMEMBER ON THE DAY? There’s nothing to do now but enjoy the moment, the stressful parts are done. Make sure to have a giggle! Go with the flow, be in the moment and trust that your celebrant has got you covered. Trust your suppliers. Trust your suppliers. Trust your suppliers. Your wedding suppliers are experts in their field and if you give them a little creative freedom, they will go over and above your expectations on the day. YOUR NUMBER ONE MUST HAVE AT A WEDDING? Music. Whether it’s live or just put through my PA system, I like to have music on whenever there’s no talking. Sunscreen! But I’m a pasty one. Head on over to our Vendor Guide! We’ve curated our favourites all in one handy spot.